Increase your opportunities to reach your community with the gospel! Email tbrown@sacbaptist.org with any questions. See calendar below for available dates. Be patient, it may take a few minutes to download. 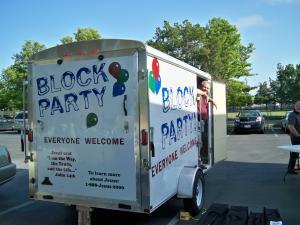 Tell us about your Block Party! Note: The trailer will be in transition the day prior and following the calendared event. The EBPT Calendar is update frequently but not daily. Use email srbn@sacbaptist.org to contact the office regarding the EBPT.